Maintain strong commitment to quality with attention to detail. Work with responsibility, take ownership of allotted projects. Work independently and in team. Communicate your thoughts with clarity. Use Source Control and Bug Trackers (Subversion, Git, Redmine, Jira etc...). Collaborate with global cross-functional teams to define, design, and release new features. Test all changes for robustness, edge cases, usability, and general reliability. Interview process includes a 4 hour System Test where you will be asked to solve sample problems by writing code or debugging existing code. Please apply only if you have at least 1 year experience of working on actual projects in a team. At least 5 year experience as a developer, and at least 2 year experience with a technology domain mentioned on our Solutions page. Walking Directions from Udyog Nagar Metro Station. Udyog Nagar Metro Station is on National Highway 10 on Metro Green Line. Change Metro at Kirti Nagar Metro Station if you are coming via Metro Blue Line, or at Inderlok Metro Station if you are coming via Metro Red Line. Exit Udyog Nagar Metro Station from Gate No 2 (towards Right). Walk forward (west) across Metro Parking Lot. Take first Right towards Udyog Nagar. Continue walking north till you reach Railway Underpass. Walk under the Railway Underpass. Turn Right immediately after exiting from under the Railway Underpass. Turn Right again on reaching end of road. Walk (south) till you reach a Left Turn (don’t turn left). (ITI Mangolpuri will be on your Left). 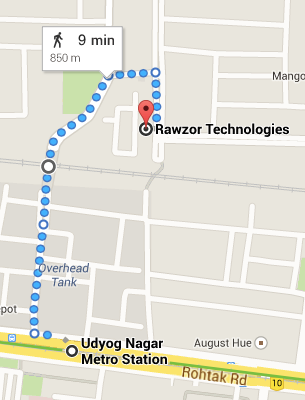 Rawzor Technologies is on your Right. 9 Minute Walking Distance from Udyog Nagar Metro Station. 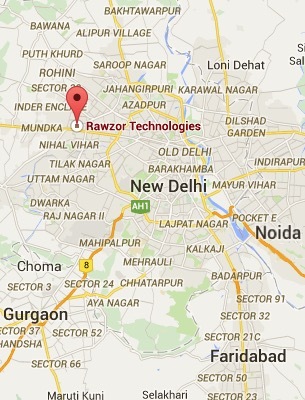 Rawzor Technologies is located in Mangolpuri Industrial Area, West Delhi. Join our team, apply now at hr@rawzor.com.